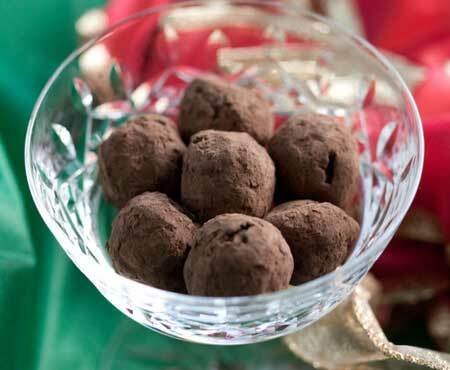 If you like chocolate truffles, here’s a great recipe from Chef Jean-Philippe Maury. I made half a batch yesterday all the while wondering why I don’t make these more often. They’re simple but so delicious and open to improvisation. You can infuse the chocolate with whatever flavor you like, then package them up in a myriad of creative ways for gift giving (though mine are in a plastic tub in the kitchen and I’ve been eating them myself). I did make a few minor changes to JPM’s recipe. Orange zest was omitted and Kahlua replaced the Grand Marnier. I also scooped the truffle center instead of piping it, and used a spoon to coat the balls in chocolate before rolling in the cocoa. Chef Jean-Philippe’s method of using gloves sounds more fun, but I didn’t have any disposable gloves. Combine the orange zest and the heavy cream in a small saucepan and bring to a boil. Strain the orange infused cream over the chocolate and let it set for one minute. Stir gently with a whisk (do not beat or you’ll incorporate air), starting in the center and working your way to the edge, until the ganache is smooth. Stir in the liqueur if using. Cover the bowl with a plastic wrap and let set at room temperature until thick enough to hold its shape, approximately 2 hours. Using a pastry bag with a 3/8-inch opening tip OR using a small cookie scoop (in which case the truffles will be much larger), pipe or scoop mounds (about 3/4 inch high and 3/4 inch wide if piping) on parchment-lined baking sheets. Meanwhile, melt the remaining 3 ounces of chocolate. With gloves on, coat the palm of your hands with melted chocolate and gently coat each chilled truffle. Immediately toss the coated truffles in chocolate powder with a fork. Store the truffles inside an airtight box at room temperature. Mmmm, these make such good christmas gifts! If I make these this weekend, & store as directed, will they be okay to eat at Christmas? These look great and most likely won’t last until Christmas, but I know my father in law will LOVE these. I’ve thought of making my own truffles but I’ve never actually done it. Yours look really good. Good looking recipe. I always prefer truffles coated with chocolate (rather than just rolled in cocoa) so there’s a little crunch biting into the soft center. Another thing on my list of “have-to-dos” that I haven’t gotten around to yet. They’re so simple, and yet when it comes to thinking about things to make it never comes up (maybe because I rarely have heavy cream around). For me these would be bathed in cashews or almonds 🙂 *drool* Thanks for the reminder Anna :).